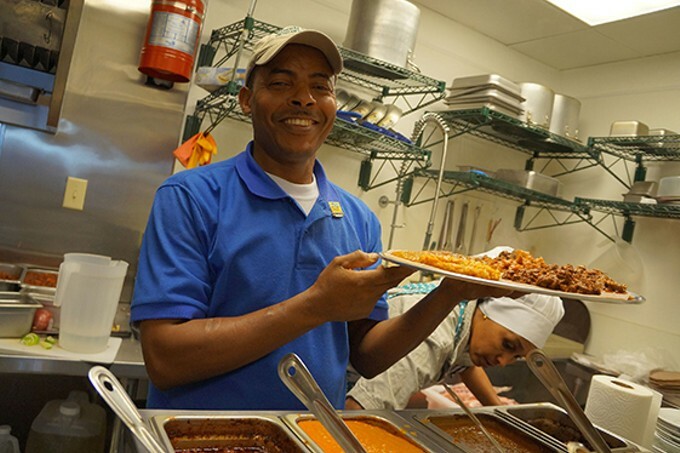 Monday-Saturday 11 a.m. to 9 p.m.
Eritrean cuisine is slightly skewed from its more familiar neighbor, Ethiopia, as far as cooking is concerned. But not by much. Perhaps it might be the fact that Eritrea relies less on seasoned butter and more on the use of oils and tomatoes. These are tiny pops of homespun custom that keep with the region's availability of grains, vegetation and game. 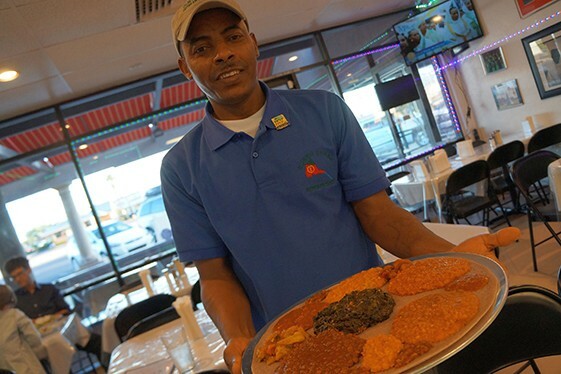 If you've experienced Ethiopian cuisine—and we do have a few options here in Tucson—then the food at Queen Sheba should not only please, but give nod to tones and tastes of a desert country that is rife with intense flavors, smooth textures and a spongy bread that you use instead of bulky forks and spoons. Injera, which is sometimes called taita in other regions of Africa, is a sourdough-risen flatbread made from teff flour, then baked in a very specific oven. If you are not used to eating with your hands, well, get ready to learn how. 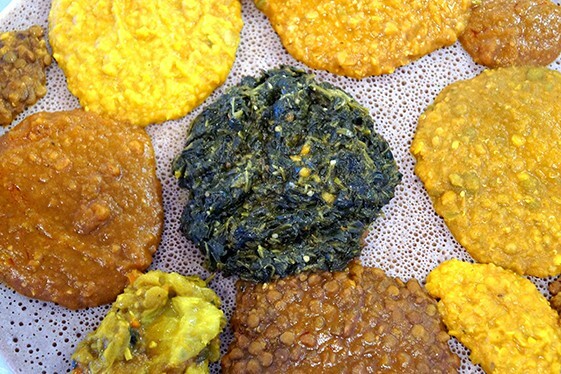 When the large plates appear at your table, all dotted with mounds of colorful edible variants, you simply break off a bit of injera, nab something that catches your fancy and pop it in your mouth. 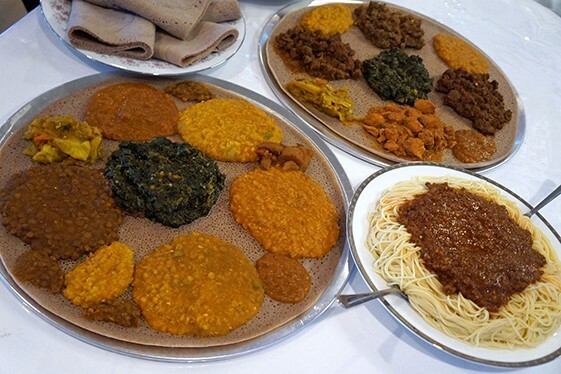 I'm a longtime fan of African cuisine, but my absolute favorite has to be Ethiopian and Eritrean. My first experience with it was in a small place in Berkeley, California, more than 20 years ago. Walking in, I had no expectations or any real idea what I was in store for. When the food arrived, all I saw were small dollops of brown and green stews with a few vegetables. It didn't seem like enough and I was starving. After getting schooled on how to eat with the injera, it didn't take long for me to get full because of all the bites of the bread getting packed in along with all of those bright, aromatic and downright delicious slow-cooked stews. It was amazing. So, when I entered Queen Sheba for the first time and met owner/chef Welday Gezehan, I was hoping to get that happy taste revelation I was fortunate to receive so many moons (and plates) ago. Let's just say after a few bites, Gezehan's food not only brought me back to that tiny Bay Area café but pushed me forward into a new level of appreciation for his home country's cuisine. When Gezehan moved to Tucson with his wife Negesci, he had a simple dream of opening his own restaurant with the hope that the good people here would easily catch on to his style of cooking. 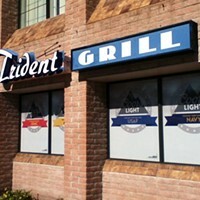 After stints of working in various kitchens (and even delivering pizzas), Gezehan landed his spot on Grant Road just east of the Tucson Medical Center. The meat dishes are plentiful, but Queen Sheba also offers a myriad of vegetarian and even vegan options. Try the Shero, with onions, tomatoes, red and green peppers and garlic simmered in a chickpea sauce, or the Alichia, which is similar to the Shero, but made with split peas and has a milder yet denser flavor. Not only should you get used to eating with your fingers, but you should start getting acquainted with the flavor of berbere—essentially the Ethiopian/Eritrean salt and pepper—because it is used in a lot of dishes. It has an almost sweet curry hue to it and, literally, it can go with anything. Including spaghetti. That's right: spaghetti. In the 19th and early 20th century, Italian occupation of Eritrea introduced the locals to pasta and when they were liberated around 1930, Eritreans held on to that noodle staple but made it their own. Gezehan makes his own version with beef spiced with, you guessed it, berbere. It almost doesn't make sense to have spaghetti on the menu, but if you know some history, you're just glad Queen Sheba keeps that tradition alive. Eritrean food is family food; it is to be shared and enjoyed by everybody. That's the central vibe that Queen Sheba invites. Welday, with his wife and young daughter, says that when you arrive, you might be a stranger. But when you leave, you are family.